Prepare stir-fry pepper blend, add diced onion according to package directions. Heat barbecue beef according to package directions. While vegetables and beef are cooking, mix barbecue sauce and ranch dressing in small serving bowl; set aside for dipping sauce. 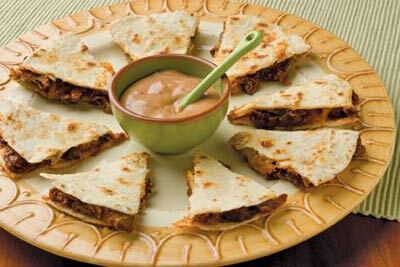 On a tortilla, evenly layer 1/4 cup plus 2 Tablespoons each of shredded beef and cheese. Add about 1/4 to 1/2 cup vegetables. Cover with a second tortilla. Repeat for total of 4 quesadillas. Spray large skillet or counter-top grill with non-stick cooking spray. Cook each quesadilla for 3 minutes on each side or until golden and cheese is melted. Cut into 8 wedges; serve with barbecue-ranch dipping sauce.